In this post you’ll learn about the toxic exposures from crib mattresses, why an organic crib mattress is so important, and why you get the most value buying the best organic crib mattress from Healthy Child. Are Eco-Friendly or Plant-Based Mattresses Healthy? How do Organic Mattresses Pass Fire Standards? Babies and children are constantly exposed to chemicals. Most of these chemicals have never been tested for toxicity, so caution is recommended to keep your baby safe from exposure. You might be aware of the chemicals in crib, bassinet, cradle and porta-crib mattresses and are searching for a healthy organic baby crib mattress. Organic is important, but the main thing to determine is whether the mattress is non-toxic. Even organic mattresses can contain unsafe materials. Your baby’s mattress exposure is up-close, extensive, and long-term. Babies sleep on a mattress for 10-14 hours or more a day during their most fragile developmental years, lying directly on the mattress, breathing in and absorbing whatever is in the mattress. A 2014 study done at The University of Texas at Austin found that babies are exposed to high levels of chemical emissions from crib mattresses while they sleep. The researchers found that body heat increases emissions and chemical emissions are strongest in the sleeping infant’s immediate breathing zone. These chemical exposures can negatively affect the health and brain development of babies. When it comes to your baby, there is no safe level of exposure. I have thoroughly investigated the safety and toxicity of baby crib mattresses to find the best and safest organic crib mattress. I wrote the following report to help you distinguish facts from the mountains of misinformation and choose the best organic crib mattress for your baby. What’s in a Typical Crib or Baby Mattress? Polyurethane foam is the filling material used in most baby mattresses. It is made from petroleum and is highly flammable. It contains chemical additives and flame retardants. Foam breaks down over time into small particles, which can become airborne. Many crib mattresses have a vinyl covering for waterproofing purposes. Vinyl (polyvinyl chloride or PVC) is considered to be one of the most toxic and environmentally unfriendly plastics in use today. Vinyl chloride, an intermediate component in the manufacturing of PVC, is a combination of petroleum and chlorine, and is a known human carcinogen. Vinyl may also contain flame retardants. Since PVC is a hard plastic, chemical plasticizers must be added to make it into a soft and flexible covering. These plasticizers (the most commonly used are phthalates) make up 30%-40% of the weight of the vinyl surface of a crib mattress. They are not bound to the vinyl and leach out or off-gas into the surrounding air. It’s important to know that although certain phthalates have been banned in the US, alternatives now being used (including legal phthalate variants) are not tested and might be just as toxic. It may take years of additional research before safety can be determined. No one really knows what level of additives in vinyl is safe for babies. So when you see a product description with “non-toxic vinyl” or “phthalate-free vinyl”, you need to understand that it’s probably far from non-toxic. Some manufacturers are starting to replace vinyl coverings with fabric attached to a polyurethane backing. This means the crib mattress surface is not waterproof and that’s a problem. Crib mattresses need to be waterproof to avoid baby sleeping on mildew, mold, and fungus. And some crib mattress manufacturers are spraying the top of the mattress with PFCs – perfluorinated chemicals – to make the fabric waterproof. This is the same toxic stuff that’s in Teflon and Scotchguard. Not a good thing for your baby to be sleeping on! Mattresses made with polyurethane foam and PVC are highly flammable and will burn quickly if ignited. When these mattresses burn, extremely hazardous gases are formed and released into the air. Because of this, the U.S. government requires all mattress manufacturers to meet strict flammability standards. Ironically, most do this by adding more toxic chemicals. Polybrominated diphenyl ethers (PBDEs) are the primary fire retardant chemicals used in mattresses for decades. These chemicals break down and leach out into the surrounding air. Research has shown that microscopic particles from fire retardant chemicals contaminate household dust. Some states have banned certain brominated fire retardants, but these have been replaced by other PBDEs or other chemicals that may be just as toxic. Manufacturers are not required to test these chemicals for the effects on health and there is very little data available to show safety. You can’t purchase a mattress in the US that does not pass fire-proofing laws, unless you have a prescription from a licensed physician. This goes for all mattresses – baby, child and adult – and includes organic mattresses. So if you bought a mattress without a doctor’s prescription (even 20 years ago), it contains some type of fire retardant materials. If you bought a mattress, including a crib mattress, more than a few years ago, it most likely contains pentaBDE, a banned form of PBDEs. Because of the huge public outcry against PBDEs (particularly pentaBDE), and because California has already banned it, mattress manufacturers are moving away from PBDEs. However, they still need to meet the government flammability standards, and their mattresses are still filled with petroleum-based polyurethane foam or so-called “soybean foam”, which remains highly flammable. So they are merely replacing these PBDE chemicals with other fire retardants, whether as additives or as barriers. In general, the mattress manufacturers do not reveal the actual specific chemicals that are used to meet the government flammability regulations, and this is perfectly legal being that the law doesn’t care how a mattress meets the standard or what chemicals are used, but only that the flammability standard is met. A common flame retardant now being used is chlorinated Tris (TDCPP), which has been found to change the DNA of people exposed and is listed as a carcinogen. This is the same fire retardant chemical that was removed from children’s flame retardant pajamas back in the late 70s because it was suspected of causing cancer. But it wasn’t formally banned, just voluntarily removed so now it’s in couches and mattresses! It is absorbed through the skin – that’s why it was removed from children’s sleepwear. It’s also now in the household dust of most homes. Several scientists claim that toxic gases released from crib mattresses, when breathed or absorbed by a sleeping baby, can cause crib death or sudden infant death syndrome (SIDS). These claims have not been scientifically proven, nor have they been disproven, and there is urgent need for more research. A 100% successful crib death prevention campaign has been happening in New Zealand for the past two decades. Midwives and other healthcare professionals throughout New Zealand advise parents to wrap the mattress to block toxic gases from exposing the baby. During this time, there has not been a single SIDS death reported among the many (estimated over 200,000) New Zealand babies who have slept on mattresses wrapped in a specially formulated cover. The SIDS rate in NZ has dropped dramatically since this mattress-wrapping campaign began. This is usually attributed to putting babies on their backs to sleep. This makes sense since babies sleeping face up are not exposed to as much toxic gas as those sleeping with their faces in the mattress. Are Toxic Gases in Crib Mattresses Causing SIDS? 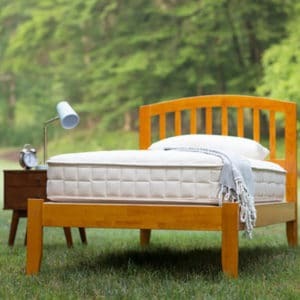 Most people assume that if a mattress is organic, then it must also be non-toxic and safe. This is not necessarily true. There are organic crib mattresses on the market that contain organic cotton as the filling, but the outer covering is vinyl or some other type of harmful material. In addition, fire retardants and other various chemicals may be added to the cotton or to the outer covering. It is important to check with the manufacturer and inquire about all the materials used. Organic is definitely important when choosing a mattress, but the main thing to look for is whether the mattress is non-toxic and safe for your baby. Your baby’s mattress must be organic AND non-toxic. Let’s clarify what it means to be organic. When referring to agricultural products (regardless of whether edible, like apples and tomatoes, or non-edible, like cotton), organic refers to the way that the products are grown, raised, and processed. Only the fiber used in a mattress, such as cotton or wool, can be considered organic per the agricultural standards since these are agricultural products. Other materials in a mattress, such as a plastic covering or innersprings are not agricultural, therefore cannot be organic. If cotton is organic, it is grown without the use of toxic pesticides and fertilizers. This is important because cotton is a highly sprayed crop and the residues from pesticides can remain in the cotton fiber. Plus organic cotton goes a long way to protect the health of our environment. When wool is organic, the sheep are fed only organic food and raised without synthetic hormones and pesticides. Organic wool producers are also required to comply with ethical management practices that support the health of the animal and the environment. Additionally, the wool is cleaned and processed without the use of toxic chemicals. The USDA National Organic Program (NOP) has created strict standards for producing and processing agricultural products to be sold as organic in the US. In order to ensure that these standards are being met, the NOP has accredited about 50 organizations throughout the world as organic certifiers. When agricultural producers want their products to be labeled as organic, they must adopt certain practices for three years and then go through a certification process with one of these NOP certifiers. A mattress itself is not an agricultural product and therefore cannot be certified as organic by the USDA National Organic Program. However, standards have been developed to give consumers assurance of finished products (like shirts, jackets, and mattresses) made with organic fibers and textiles. These standards, called the Global Organic Textile Standards (GOTS), have become the recognized organic textile processing standards for mattresses. The standards require that all fiber and fabrics used within a mattress, with limited exceptions, must be made from National Organic Program (NOP) certified materials and processed in accordance with the Global Organic Textile Standard (GOTS). All other components (such as innersprings, fire protection, etc.) must meet stringent non-toxic standards. With a mattress, we’re concerned with the finished product AND all the individual materials within the mattress. Although there are many GOTS approved certifiers throughout the world, the largest certifier in the US is Oregon Tilth Certified Organic (OTCO). In recent years so-called green, eco-friendly, or plant-based mattresses have come on to the market. You may see them labeled with descriptions such as Eco Foam, Bio Foam, or Soybean Foam. What most of these manufacturers do is replace a small percentage of the polyurethane foam with plant-based ingredients. It looks great to call it “eco-friendly” or “green” but many of these mattresses are far from healthy or non-toxic. Soybean foam is usually polyurethane foam with 12-17% soybean oil mixed in. It’s at least 80% petroleum/chemical based and highly flammable so it needs fire retardant chemicals to comply with the laws. Any company can refer to their mattresses as “green”, “healthy”, or “eco-friendly” since there are no laws or guidelines that say they can’t. Don’t be fooled by this green-washing. You may be getting a load of toxic chemicals and off-gassing with these mattresses. Some crib mattresses have surface fabrics made from “bamboo”. This sounds good, too, until you check into the manufacturing process. Strong chemical solvents might be used in the processing of bamboo resulting in a cellulose fiber similar to rayon. “Bamboo” mattress coverings are usually a synthetic fabric with not much of the bamboo plant in the finished product. Wool is also commonly used in mattresses and bedding since it is naturally fire resistant, does not provide a favorable environment for dust mites, and handles moisture well. Wool is an excellent bedding material for many reasons. However, wool can be allergenic and you don’t know if your baby will be allergic to wool. It may be true that most allergies to wool are actually chemical sensitivities to the chemicals used in processing wool. But people, including babies, can be allergic specifically to the natural animal fiber. It’s difficult to know in advance about a baby’s allergies and allergies can develop over time. Latex (natural rubber) is also used as a crib mattress filling. Shopping for a latex crib mattress can be complicated since even natural latex can contain questionable chemicals added during processing. In addition, natural latex contains proteins that can be highly allergenic and known to cause anaphylactic shock, however this is extremely rare. It’s important to buy a baby mattress that is waterproof. Babies can generate a lot of wetness while they sleep, and this wetness can cause mold, mildew, fungi or bacteria to grow in the mattress. Since mold and fungi can be a health hazard for a baby, it’s crucial to not allow moisture to get into the surface of a crib mattress. 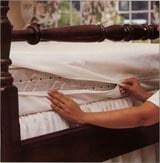 A non-toxic waterproof covering is essential to eliminate wetness and dust mites from a mattress. Plastic is currently the only viable way to make a mattress completely waterproof. But not all plastics are the same. Some are quite toxic and environmental unfriendly (as in vinyl) while others are non-toxic and more environmentally safe. It’s imperative that the plastic be non-toxic. 100% natural organic crib mattresses (latex/wool) usually have an organic cotton surface, and these mattress are not waterproof. It’s imperative to cover your latex/wool mattress with either a organic cotton waterproof pad with a plastic lining or an organic wool mattress pad specifically designed to block wetness. The wool pad should be layered with a cotton protector pad. Environmental scientists agree that low density, food-grade polyethylene is the safest plastic available. It has a simple molecular structure and does not contain phthalates or other unsafe additives. Unlike the production of vinyl, dioxins and other toxic chemicals are not released into the environment during production of low density polyethylene. This is the material used for the mattress covers designed to prevent SIDS in the crib death prevention campaign in NZ. You can’t count on wool alone to waterproof a mattress. If there is a lot of wetness from a baby or child, it can go through to damage the mattress and create mold and mildew problems. 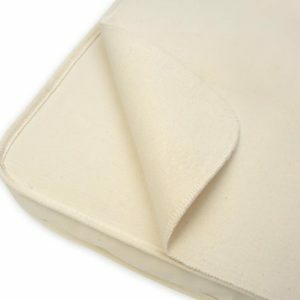 If you’re going to use a non-waterproof mattress, I recommend layering a 100% organic wool puddle pad (specifically designed to block wetness) with an organic cotton mattress protector to serve as an extra layer of protection. Cotton absorbs moisture and wool repels and wicks moisture away. When used in concert, the wool and cotton pads together can block wetness. However, the best option is to get a safe waterproof crib mattress in the first place, so you don’t have to worry about mold and mildew. As mentioned before, the U.S. government requires mattress manufacturers and retailers to obtain a doctor’s prescription from a customer before selling a mattress that does not meet federal fire safety standards. The prescription must be from a physician licensed in your state that says “this patient requires a chemical-free mattress”. This can be written by any licensed physician, including medical doctors (MD), osteopaths (DO) and chiropractors (DC). However, there are now mattresses that pass fire standards without toxic materials that can be sold without a prescription. Many organic mattresses contain chemical fire retardants. Yet they are called “organic” simply because the cotton filling is organic cotton. In stores or on websites, it may say “free of fire retardants” or “PBDE-free”, but the truth is that there has to be something that is allowing it to pass the fire testing. The manufacturers may have replaced the PBDE chemicals with other non-tested fire retardants. It’s difficult to get this information out of retailers or manufacturers since most do not reveal the specific chemicals used. Wool is fire-resistant, and is the most common fire protection used in natural, organic crib mattresses. If a wool-wrapped mattress has been tested and approved to meet flammability standards, the manufacturer is able to sell it without obtaining a prescription. There are companies that use only pure wool for this purpose. But be aware that some companies may use wool with chemical treatments added to boost the wool’s fire resistance. Borate powder (boric acid) is also used to make mattresses fire resistant. Most mattresses treated with borate powder meet Federal flammability standards and do not require a doctor’s prescription. There is conflicting information regarding the safety of using borate powder in mattresses. Since it is an insecticide and is potentially toxic, I would avoid borate powder. Naturepedic crib mattresses are the only safe waterproof organic mattresses I can recommend. Naturepedic is the only company that uses food-grade, plant-based polyethylene (made from non-GMO sugar cane) for the purpose of waterproofing and dust mite proofing. Strict independent testing confirms there are no phthalates or any toxic chemicals in this polyethylene. Naturepedic baby and crib mattresses have certified organic cotton as the filling material. There is no polyurethane foam in their mattresses. With Naturepedic’s innovative design, the mattresses passes all Federal and State flammability standards without the use of any fire retardant chemicals or barriers. They use organic cotton fabric, organic cotton fiber and PLA fiber (made from plant starch). All Naturepedic baby and crib mattresses are GOTS certified. They are certified to the GOTS standard by Oregon Tilth Certified Organic (OTCO) and Control Union (CU). They have also passed independent testing by the strictest GREENGUARD Select standard. In a Naturepedic mattress, there are no flame retardants or flame retardant barriers, no perfluorinated chemicals (PFCs), no antibacterial treatments or biocides, no glues or adhesives, no allergens, and no GMO cotton or other GMO fibers. Naturepedic also offers a non-waterproof quilted organic cotton crib mattress with a certified organic cotton covering. This is a traditional innerspring mattress that is safe and healthy. Thank you for all your research. I noticed you sell the Naturepedic waterproof crib mattress protector, which contains polyurethane. I’d like to better understand why you recommend this product given your concerns about polyurethane. Ruth, that is really a great question. It’s important to understand there is a big difference between polyurethane plastic and polyurethane foam. Different chemicals and additives are used to make the foam. The only way to fully waterproof a mattress is to use plastic. Determining the safety of a plastic waterproof pad depends on how the plastic is manufactured and what chemicals are used. Polyethylene works great in the mattresses, but since mattress pads are put in the washer and dryer, the polyethylene would break down from the heat so can’t be used in this case. So Naturepedic uses a specially formulated polyurethane plastic (not foam) that is proven to not leach harmful chemicals. It is made from the same grade material as is required for food contact applications. This is a very thin film that is encased in organic cotton. We are confident that the Naturepedic Organic Cotton Waterproof mattress pad is safe, and it is the only waterproof pad that we know of that is GOTS and GreenGuard Select certified. How about pillows? Do they have flame retardants? Pillows made with natural fibers are not likely to contain fire retardants. But it’s always good to check with the retailer or manufacturer. None of the pillows on the Healthy Child site contain fire retardants. Everything is free of flame retardants. Unfortunately, GreenGuard has changed over the years. The very basic standard used to be GREENGUARD “Air Quality” Standard, and then they added the “Children & Schools” standard which was a bit more stringent. Then they realized they needed something even more stringent, so they created the “Select” standard, which was strictest possible. Only a few manufacturers (across the board) were certified to this standard. Naturepedic was the only crib mattress manufacturer that was certified to the Select standard. Unfortunately, I’ve learned that GREENGUARD was recently bought by Underwriters Laboratories (UL), and everything has changed. UL has a different philosophy (business model) than the original GREENGUARD. UL is not interested in only a few companies meeting a standard. They want standards that virtually everyone can easily achieve – and pay the fees! So they discontinued the Select standard and created the Gold standard, which is very basic. So pretty much any mattress manufacturer (including those who use vinyl, polyurethane foam, and flame retardants) can now achieve GREENGUARD Gold certification by paying the fees. Makes it pretty meaningless at this point. I looked at the mattress you’re asking about and it has memory foam, and I would definitely be concerned about that. That would have never passed the GREENGUARD Select certification. Urethane and polyurethane are the same when it comes to mattress filling. GREENGUARD does not prohibit polyurethane foam in its Gold certification program. GREENGUARD Gold also does not prohibit flame retardants, vinyl, phthalates (except for the few that were banned, there are many more), and many other chemicals. GREENGUARD charges a fee for its certification. CertiPUR-US is a certification program provided by the Polyurethane Foam Association for polyurethane foam, which means that the mattress definitely contains polyurethane foam. Very informative indeed. What worries me when using food grade plastic on an existing mattress to stop the toxic smells is whether there’s any chance of suffocation because of the plastic. I was thinking of sewing a cotton cover after covering the mattress with plastic. I still feel that it will limit the baby’s breathing. Is my concern justified? There is no worry about suffocation with the polyethylene covering on the Naturepedic baby and crib mattresses since it’s a thick plastic that is completely attached to the mattress. There is no way that covering can be dislodged or bunched up. However, it sounds like you are talking about covering your mattress with plastic yourself. I don’t recommend that unless you are using a BabeSafe mattress cover that is designed specifically for this purpose and you explicitly follow the directions to make certain you wrap it correctly. Covering your baby’s mattress yourself with any other type of plastic IS a suffocation risk and is not safe. And yes, a 100% cotton mattress pad is a good idea to make the surface more breathable and to absorb the normal wetness that a baby can generate. We have organic cotton mattress pads available here that are sized correctly and that won’t bunch up. I thought it was supposed to be 100% cotton except for the polyethylene plastic for the waterproof covering? I know you said polyethylene plastic is okay but not foam … Now I’m worried the mattress contains the stuff you said was bad!! Can you shed any light on this? Sorry the law tags are so confusing! The government law label rules require specific wording that unfortunately does not represent what’s really in the product. It’s really crazy, but the manufacturers’ hands are tied – they have to comply. The Law Label rules do not allow for the term “cotton” by itself, and the word “organic” is not permitted on a Law Label. “Organic Cotton” or “Organic Wool” or “Organic Latex”, etc. is illegal terminology on a Law Label. Crazy, but true. It’s the polyurethane foam that you need to be concerned about, not polyethylene. They are completely different. Polyethylene “foam” does not involve a chemical process. It involves heating and flash cooling the polyethylene so it forms closed cells with air in the cells. The law label rules require it to be called foam. Now that I read your response I feel so silly…the words are completely different!! Can we blame it on mommy brain and first time mom jitters?! Hi there! I have a question about baby bjorn travel light crib. It is their version of a pack and play. 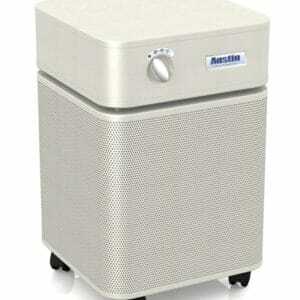 I purchased it used in an effort to keep my house free of toxins and stay within my budget. The tag copyright states 2010. I was shocked when I opened it to see that the foam says 100% polyurethane!!! What?!? I am currently seeking a baby Babybjorn bassinet but now I’m second-guessing. Can you advise? Jenn, unfortunately we haven’t been able to find anything we can recommend. Hi Jane! Thank you for the wonderfully informative article! We’re expecting our second baby soon and unfortunately don’t have it in our budget to purchase a naturopedic mattress. Are there any other mattresses you can recommend, or anything we can do to help make our current mattress safer? I’m at wit’s end trying to work out an alternative! I’ve used Baby Crib Mattresses for my baby a long time but i don’t they may be harmful. Thanks for your useful information. So, are Naturepedic mattresses waterproof in and of themselves? Or do you need to purchase the waterproof mattress pad in addition? If you are saying that Naturepedic offers a model that isn’t waterproof, with a washable, non-plastic outer covering, wouldn’t that mean that those mattresses would be susceptible to mold and fungus growth by fluids getting through the cover and into the mattress itself (similar to the situation with wool pads)? If so, why would anyone elect for a non-waterproof model, especially if the plastics in the Naturepedic waterproofing are safe? Yes, most of the Naturepedic models are waterproof in and of themselves. You do not need a waterproof mattress pad for these models. But for people who do not want a crib mattress with plastic covering, Naturepedic also makes a model that is not waterproof. Yes, these are susceptible to mold and fungus, so they will need either a waterproof mattress cover or perhaps 2 wool puddle pads to stop wetness from getting into the mattress and causing problems. It’s really personal choice. Some people prefer all natural materials, even though the plastic is completely safe. Thanks for helping me understand that. From reading this site, it appears that Naturepedic is the only crib mattress truly free of harmful plastics and chemicals. I’m assuming the same would be true of their mattress pads. However, if I make the investment in the Naturepedic mattress, I’m wondering if there might be mattress pads on the market that are less expensive than Naturepedics, but as safe. One example I’ve been eyeing is the Baby & Brooke organic bamboo mattress pad. In your estimation, is that pad (or any other brand) equal to Naturepedic’s? To be more specific, Naturepedic is the only WATERPROOF crib mattress that I know of that is truly free of harmful chemicals. Regarding the waterproof mattress pads, I haven’t found any others yet that I could recommend. It takes a lot of digging deeply into all materials and manufacturing, certifications, testing, etc. I took a quick look at the one you mention. They say the surface fabric is bamboo, but it’s actually rayon. To get a fiber out of bamboo it needs to be made into a rayon or viscose fiber using a chemical process. The bamboo plant they started with may be organic but once it’s made into a rayon fiber, it’s no longer organic. As long as the mattress is waterproof, you really don’t need a waterproof mattress pad. If you want to save money, you could get a 100% cotton mattress pad (not waterproof) and that would be much safer than buying a questionable waterproof pad. Interesting — so maybe I could do things in reverse: get a safe, non-waterproof mattress and a couple of Naturepedic waterproof mattress pads… Again, I’m just looking for safety AND affordability. Can you point me toward the non-waterproof mattresses you have in mind? Thank you for checking on the Baby & Brooke pad. I found it interesting that they don’t appear to have a website and there is no available company info for them on Amazon. Nor a BBB listing. That seems suspicious. After all, how could a small company produce something like mattress pads — which involve plastics and chemical processes and machine-stitching. It makes me wonder if there’s nothing more than marketing mumbo-jumbo and repackaging going on here. What a brilliant and informative Article! As a mum of a 2 year old and another one on the way, I heard about non-toxic products just a couple years ago. The more I researched into it, the more crucial I found it to be that parents are aware of the dangers of everyday mattresses and cribs we buy, thinking them harmless for our babies. I’m considering buying a new crib for my upcoming baby #2, and such info is invaluable. Thank you for the detailed article, along with your willingness to reply to everyone’s questions. I’m struggling with the cost of the Naturepedic mattresses. My questions are, which is more toxic, a mattress with polyurethane foam or the flame retardant chemicals? I see a lot of mattresses that claim to not use flame retardant chemicals but then use foam. For example, Eco Classica III Eco-Friendlier Crib Mattress. It seems to tick all the boxes. Or am I’m missing something? Secondly, I just came across an article that Lullaby Earth mattresses are just as good as Naturepedic. In fact, I’ve seen claims that Naturepedic owns Lullaby Earth. What do you know about this? I’ll first answer the question about which is more toxic – mattresses with polyurethane foam or flame retardant chemicals. Actually they are the same. Since polyurethane foam is highly flammable, it’s currently difficult, if not impossible, for manufacturers in the USA to source foam that is not flame retardant. So even though a manufacturer may not add flame retardants to the mattress, the chemicals are most likely already pre-mixed into the foam that they purchase in bulk. Flame retardant free foam, if available, is very expensive so it’s probably not used in the inexpensive crib mattresses. So if it has polyurethane foam, it likely has flame retardants, even if they didn’t add it themselves. Yes, Naturepedic owns Lullaby Earth and that’s a reasonably safe brand. Naturepedic is offering Lullaby Earth as an option for people who cannot afford the Naturepedic brand. Lullaby Earth mattresses are a better alternative to mattresses with PU foam. There is no polyurethane foam or flame retardants in Lullaby Earth mattresses. Are Lullaby Earth mattresses as good as Naturepedic mattresses? No they are not. Naturepedic uses organic cotton and Lullaby Earth uses PET, made from recycled pop bottles. In addition, the polyethylene waterproof surface of the Naturepedic mattresses is now plant-based, made from non-GMO sugar cane. But if you can’t afford a Naturepedic mattress, the best option for safety is Lullaby Earth. “Every single mattress manufactured by this brand is completely, 100% organic and non-toxic and made from 100% natural materials. Hi Gloria, I haven’t had any time to thoroughly check into the Babyletto so I can’t speak to it being non-toxic or safe. If you want to compare with Naturepedic – The Babyletto mattresses contain polyester, coconut coir, and latex. Naturepedic baby mattresses contain none of these materials. The coconut coir and latex they use might be great, but without digging deeper into the manufacturing of the coir and latex and finding out how it’s processed, it’s difficult to say. They don’t say how they exceed flammability standards without the use of chemical flame retardants. That’s important to know. They don’t say they are GOTS certified, they are OEKO-Tex 100 certified and that’s not the same as GOTS. Some of the materials might be OEKO-Tex certified but the entire mattress? Naturepedic is GOTS certified, the individual materials, plus the entire mattress is GOTS certified. That means that ALL components pass GOTS standards. I’ve just done research and chose a Moonlight Slumber Little Dreamer mattress bc they have he GreenGuard, and have won other “healthiest” mattress awards. Our mattress is due to arrive tomorrow and I’m feeling that maybe I need to find a local Naturepedic dealer due to some of the information you’ve shared. Please advise – have I fallen prey to more green gimmicks? The mattress is not cheap. Hi Brooke, it’s polyurethane foam with a small percentage of soy oil. It doesn’t say what the fire barrier is made of. Or the fabric. Definitely not the “healthiest” crib mattress. GreenGuard certification does not mean that it’s safe. Thanks for the information from your research. In my country, PVC are being used widely, include in mattresses, blankets and pillows. Currently I have a 4-years-old child and is pregnant with second baby for 6 months. I also read a lot of articles about organic pillow and mattress. Then after reading your research i decide to buy an organic mattress and a couple of pillow for my baby and my family too. Thanks for this info. We are beginning the process of looking for a natural mattress and would like to find a twin for our4 year old son. Need a chemical free, non allergenic one… I found your article while searching for a natural mattress, and I’m so glad to find it. I am purchasing a Naturepedic waterproof crib mattress. Which would be the most safe/ least toxic mattress cover to buy for it: a waterproof Naturepedic mattress cover, the non waterproof 100% cotton Naturepedic mattress cover , or the Babesafe mattress cover used in NZ? Hi Meredith, you don’t need a Babesafe mattress cover for the Naturepedic mattress. Both the Naturepedic waterproof mattress pad and the Naturepedic non-waterproof pad are 100% safe. You don’t need the waterproof pad on the waterproof mattress, but some people want that so they don’t have to clean the mattress if wetness goes through a cotton pad. If you have further questions, feel free to contact customer service at service@healthychild.com. Thank you so much for all this information! I was reading more about the NZ study and how it’s caused by phosphorus, arsenic and antimony (and a fungus). Do the naturepedic mattresses not have any of these substances? How can we be sure of that? It also said these substances can be found in sheepskins so I’m wondering whether wool would exacerbate the problem or is it only the skin that is problematic? I’m trying to decide whether to buy the naturepedic crib mattress or the soaring heart mattress, but I can’t figure out which is safer in terms of SIDS. If I bought a Soaring Heart crib mattress would I need a Babysafe mattress cover? And then I’m curious whether these mattresses would hold up from child to child or would reusing them increase the SIDS rate as well? Thank you again so much for all the information! Such great questions! There is no risk from phosphorus, arsenic, or antimony in any Naturepedic crib mattresses. The source of these substances identified by the NZ study is vinyl, due to the plasticizing of vinyl. In addition, phosphorus and antimony are also commonly used in flame retardants. The NZ cot death study group examined sheepskin bedding and not pure organic wool used inside a mattress. Both Soaring Heart and Naturepedic use only pure certified organic wool and the wool is covered by certified organic cotton. There is no evidence that I know of that organic wool contains phosphorus, but even if it did, the phosphorus would need the fungus to generate a gas. It is critical to waterproof a cotton and wool mattress, and if you are concerned about wool, then I would recommend the Naturepedic crib mattress since it is completely waterproof. These mattresses will hold up from baby to baby and there is no risk of re-using them. I cannot say that any mattress will prevent SIDS since there are other factors to consider in SIDS and the official cause is unknown. “The description “organic” does not guarantee that a bedding item is free from phosphorus or antimony. The description “organic” refers to the non-use of certain chemicals on/in plants, soil and animal feed. However, if the soil on which the plants or animals grow or graze contains naturally-occurring phosphorus or antimony, those chemicals will be inherently present in the bedding item regardless of the growing, grazing or manufacturing processes which have been used. There is a lot of misinformation online that leads people to believe that an organic mattress (a truly organic one where everything is organic) is automatically safe; from my understanding, it is not. I went with a fully organic mattress and then still plan to cover it with a polyethylene mattress cover for baby’s first year. I love organic mattress because they won’t off-gas harmful chemicals that have nothing to do with SIDS and that is reason enough to get them, but when it comes to SIDS, there are other gases and they can come out of a natural mattress as well. I am also very informed about the New Zealand research, I was one of the original people to publicize this to parents in the U.S. There is a possibility of a trace amount of phosphorus or antimony being in an organic mattress, IF these substances are in the soil where the organic cotton is grown or the wool (sheep) are grazed. But the main source of these substances identified by the NZ study is vinyl, due to the plasticizing of vinyl. In addition, phosphorus and antimony are also commonly used in flame retardants. Regarding wool, the NZ cot death study group examined sheepskin bedding and not pure organic wool used inside a mattress. There is no risk from phosphorus, arsenic or antimony in any Naturepedic waterproof crib mattresses and they do not need to be wrapped in a cover. These waterproof mattresses use a food grade polyethylene for waterproofing purposes. First, there is no wool in the waterproof crib mattresses. Second, in order to produce the gases mentioned in the studies, there would need to be fungus in the mattress. The waterproofing makes it so that there’s no fungus within the mattress. And third, even if there was a possibility of a gas generated from antimony or arsenic, it would be blocked by the polyethylene cover. Therefore, there is no risk from the Naturepedic waterproof crib mattresses and they do not need to be wrapped. I cannot say that any mattresses will prevent SIDS since there are other factors to consider in SIDS and the official cause is unknown. But I am confident that these mattresses are safe from chemical exposure and off gassing. Very informative post about a wonderfully innovative mattress for babies and toddlers. I love it when new things are developed to benefit infants. I was wondering what your thoughts were on Sleep On It Laytex foam mattresses. They claim there mattresses are 100% laytex with no fillers or chemicals. I am looking to replace my matress and wondering what the best option is for myself since both my of children sleep in my bed every so often. What do you sleep on your self ? Are there even any chemical free options for adults mattresses. Is there anything affordable? please help I am going crazy!!! It has GOLS certified organic latex (which is the purest latex) and the entire mattress is certified organic to the Global Organic Textile Standard (GOTS). I just purchased a Naturpedic crib mattress and the Naturpedic organic cotton crib mattress pad. I’m confused about how to use the Babe Safe plastic covers. If I cover the mattress with it and then put the crib mattress pad over the plastic, do I have to worry about issues with the polyurethane off gassing? The BabeSafe instructions also are a bit confusing, suggesting you encapsulate the crib mattress, then lay down a towel or pad, and then cover that with 2 sheets. Sherry, with a Naturepedic crib mattress, there is no need for a BabeSafe mattress cover. And there is no off-gassing from the Naturepedic organic cotton waterproof pad – it’s completely safe. A BabeSafe mattress cover is not recommended at all with these items. Thank you so much for this information. It is so helpful! We were just given a Leander crib by some friends for our 5 month old, and, due to its shape, only one specific mattress can be used with it: the Essentia mattress for Leander crib. Can you tell me if this one is safe? I’m hoping we won’t need to get an entirely new crib. Unfortunately it’s made with memory foam, which is polyurethane foam with added toxic chemicals. I would not recommend it, especially for a 5 month old. Thank you for your reply, Jane. I just got info about the kind of foam that the mattress uses. Do you know if that kind of foam would be safe? Also, does naturpedic make custom made mattresses? We will be replacing my toddler’s mattress soon with a naturpedic mattress which, we will order from you. Jane, once again, thank you for your help here! I found some further info on the mattress: “The mattress is an all natural product, made from organic memory foam, with a certified organic cotton cover, no VOC’s, it is anti-dustmites and has no toxicity.” Would that answer any of these questions (would there be fire retardants if it is VOC-free)? If we find that this mattress isn’t non-toxic we would be interested in having a custom made mattress for the crib if we can afford it. But then we wouldn’t be able to replace my toddler’s mattress, so we’re hoping this mattress will prove to be toxin free (which will enable us to afford a naturpedic toddler mattress). Otherwise we would just have to get a new crib, too. Sarah, I did a little digging and found that they use a Kevlar fabric that encases the mattress to make it fire proof. Kevlar is what bullet proof vests are made of, but for mattresses, it’s made into a polymer fiber. I looked into Kevlar many years ago and the outcome of that was that I was unsure about the safety of this material in mattresses. Is it safe to sleep on for babies? It could very well be fine. I can’t say that it’s safe or unsafe. The MSDS shows some toxicity, but that’s for the dust that workers are exposed to when creating the material. Not the same as in a mattress. I think it just depends on your own comfort level. Sorry, I don’t know enough about kevlar to give you a straight answer! Sarah, honestly, if I were in your shoes and finances were tight, I would keep that essentia mattress and use it with a Naturepedic organic cotton waterproof pad. IF there is any VOC coming from that mattress (and I’m not saying there is), this would help. It’s not made for blocking VOCs, the purpose is waterproofing, but it will block some. And you’ll need waterproofing anyway. In answer to your other question, Naturepedic cannot make a custom mattress to fit that crib, but Soaring Heart can. You can get a quote from customer service at service@healthychild.com or 1-800-402-8841. Gaye or Valerie will answer and will be happy to help you. My daughter has been using a Naturepedic mattress for the past 2 years, and I’m now pregnant with a baby who is due in June. Is it safe to re-use the mattress for him? Amy, yes it’s safe to re-use the Naturepedic crib mattress. You can pass it down from one baby to another. What is less toxic, the Naturepedic waterproof mattress alone or the Naturepedic non waterproof mattress with the Naturepedic waterproof cover on top? Liz, neither of these options are toxic. However, the Naturepedic waterproof mattress alone uses only plant-based polyethylene made from non-GMO sugar cane. The Naturepedic waterproof cover cannot use this polyethylene since it would break down in the wash. Plus the Naturepedic waterproof mattress alone is a less expensive option. Thank you so much for the sharing such a informative also helpful article.I am purchasing a Naturepedic waterproof crib mattress. Which would be the most safe/ least toxic mattress cover to buy for it? Thanks in advance for giving me the clarification. Hi James, the safest cover to buy would be either the Naturepedic Organic Cotton Flannel Pad at https://www.healthychild.com/product/organic-cotton-flannel-mattress-pad/ or the Naturepedic Organic Cotton Waterproof Pad at https://www.healthychild.com/product/organic-cotton-waterproof-mattress-pad/. Even though the mattress is already waterproof, many people prefer the waterproof one since it prevents having to wipe the mattress when wetness occurs. Currently you can get a free waterproof pad when you buy your crib mattress. Will my baby be fine with just the waterproof Naturepedic mattress alone? Do you recommend getting a waterproof or cotton pad for any reason other than convenience? Just wondering if there are safety, temperature, or breathability reasons to get a pad for topping the mattress. Also, I saw in a comment from a few weeks ago that you mentioned to someone: “you can get a free waterproof pad when you buy your crib mattress.” Is this promotion still available? If so, I would love to know about it! Thank you. Delta Children Twinkle Stars Supreme Crib and Toddler Mattress? Also would it be worth adding the naturepedic organic mattress pad to it? Thank you. Hi Robert, I understand how stressful this can be and it’s a big decision that will affect your baby’s health. That mattress contains polyurethane foam and they are calling it “healthy foam” since it’s CertiPUR-US. I don’t trust this certification since it was created by the Polyurethane Foam Association and its members and financial sponsors are chemical companies and foam manufacturers. GreenGuard also allows certain amounts of chemical emissions. The highest and most trusted standard for a baby’s mattress is GOTS organic certification. Hello, I have just read reviews but i am confuse to choose the perfect mattress for my 2 months baby girl. Can any one tell me the name of a 100% organic crib mattress? I am hoping quick reply from you guys. Thanks in advance. Hi Hannah, there is no such thing as a 100% organic waterproof crib mattress. Waterproof is important as I mentioned in this post, and the waterproofing is not organic but it’s non-toxic and safe if it’s GOTS certified. What to look for is a GOTS certified organic crib mattresses. Naturepedic organic crib mattresses are GOTS certified. Many many thanks for your recommendation. I’m pregnant (7month) with a baby, I’m confused to choose a perfect mattress for me. Can you please suggest me a perfect mattress? I’m waiting for your helpful reply. and thanks for the great informative article. Thanks for all your great advice here – the article and answers to questions. I was wondering – if the polyethylene Babesafe mattress prevents gasses coming through it does that make it waterproof too, so eliminating the need for a waterproof mattress protector? Also, although “phthalate-free” I can’t seem to find a non-PVC changing mat so should I use a Babesafe cover on that too? The organic crib would be a good option as well to parents to keep their baby away from toxic chemicals from the usual cribs that we are used to. I am currently pregnant with my 1st child. I wanted to get the Naturepedic Organic Cotton 2 in 1 Ultra/Quilted 252 Crib Mattress. but it’s outside of our price range. There are too many other Naturepedic mattresses to choose from. What is the next Naturepedic mattress you would recommend that is not as expensive as the $400 one? Also, my friend bought the Sealy Soybean Plush Foam Crib Mattress. It says it is GREENGUARD Gold Certified. What are your opinions about this mattress as well? The Naturepedic Organic Cotton Classic is a great mattress that is less expensive. You don’t necessarily need the Ultra covering or the 2 different sides if money is an issue. But the Classic is a completely safe and healthy mattress for a good price. The Sealy soybean foam mattress is mostly polyurethane foam and I would not recommend it. See the paragraph above about “eco-friendly” mattresses. GreenGuard standards have been lowered and just about any mattress can qualify now. GOTS certified is a much higher standard. Congrats on your first baby! You may want to subscribe to Healthy Child since we provide a lot of great info for new moms. Hi there, I’ve been using a naturepedic crib mattress for my daughter but she’s now ready for a “big girl bed”. I’m looking at twin mattresses. One thing I don’t like about naturepedic is that they have coils, which some argue attracts EMFs. What are your thoughts on this? My main question, however, is about twin beds. I’ve done a ton of research and have identified the Obasan Fundy twin mattress as the most ecological (non-toxic) and affordable (at a whopping $1099 for a twin). I know Naturepedic’s is somewhat cheaper, but I don’t like the fact that they have wire coils. What are your thoughts on the Obasan Fundy? Are there any other options you’d recommend for a twin bed? I really appreciate your time, and am grateful to have come accross your site! Great questions! I’ve done some research into the coil/EMF theory. The claim that coils in mattresses can amplify EMFs is not supported by science. The study that has been used as evidence was reported incorrectly. It actually found that metal-containing mattresses attenuate – or reduce – electromagnetic waves immediately above the surface of the mattress. This means, according to the study, metal-containing beds may reduce EMF exposure on the side of the body closest to the mattress, but not the other side, which could be unprotected from EMF. No other research exists on coils and EMF risks. The unsubstantiated hypothesis is that coils bound and connected with a long spiral wire might transfer electromagnetic waves. If you’re concerned about that, then you might stay away from an innerspring mattress and go with individually wrapped or pocketed coils. I have not done due diligence in checking out the mattress you mentioned, but I have thoroughly checked into Naturepedic and other mattresses on the Healthy Child site, which are more affordable and confirmed safe and non-toxic. If you want a latex mattress with no coils, the Little Lamb is a great option and still more affordable than the Obasan. I’m looking for a safe mini crib mattress for our baby due in February. Naturepedic only has 2 inch matress pads, so that doesn’t sound like a solution. I came across a new brand, Bundle of Dreams. They claim to be eco-friendly, there should be no off-gassing, … Do you know it and would you recommend it? Thanks! Hi Margot, Naturepedic’s 2″ baby mattresses are firm and the right thickness. I’m not familiar with Bundle of Dreams, took a look at their site and not enough info. Checking into their materials and will let you know when I hear back. We have been selling Naturepedic crib mattresses since 2006, we’ve sold thousands, and not once has anyone ever reported that their mattress sagged. I believe those reviews on Amazon to be fake, quite honestly. In fact, we received several of those exact type of reviews on our site, and I knew right away they were fake since the “customer” said they got no response from our company. I knew this had to be false because we ALWAYS respond right away and if anyone reported sagging we would alert Naturepedic and they would send a replacement immediately. I looked into it and these “customers” were not in our database. They were obviously fake. Amazon has a lot of those fake reviews. Please know that if ever there was an issue with a Naturepedic crib mattress they would replace it right away. That’s been my experience in all the years I’ve been working with them. Hi Jane- I have been doing extensive research on crib mattresses and have read every comment on this blog post. First and foremost, thank you so much for all the work you have put into sourcing the safest options! I truly appreciate it. I recently came across a crib mattress that I am curious to get your opinion on… the Nook Pebble Air Crib Mattress (Lite) sold on Pottery Barn’s website site for $195. I was drawn to the breathability safety factor of it for when baby starts to roll over. Also it has the GOTS certification. I would love your feedback on it. I’ve attached the link below. Thanks!! Hi Lindsey, I’ve checked into this before and it’s made with polyurethane foam, which is why I don’t recommend it. It’s not GOTS certified. GOTS does not certify PU foam. So then is certified to GOTS different than GOTS certified? I’m just trying to make sense of their wording. It’s very tricky of them! I trust your opinion more than I do pottery barn’s website, but I’m hoping this will help clarify for others as well! Thanks. Looks like just the cotton covering is GOTS certified organic, not the mattress. The problem is that the mattress core material is PU foam so it doesn’t matter that the cotton is organic. Hi Jane, I found your research and answers very helpful. To follow up on your most recent answer would your thoughts on the Nook Pure be any different? Curious about your take on the Newton. Hi Frank, I haven’t checked into the Nook Pure mattress deeply enough to know what specific materials they use. It’s not GOTS certified and not waterproof. The so-called “breathable” mattresses are great for marketing, but not such a great idea for baby. A “Breathable Mattress” eliminates the waterproofing so that the baby breathes through the surface and into the interior of the mattress. A mattress that’s not waterproof allows urine, spit-up, diarrhea, spilled milk and other impurities to get inside the mattress. This can lead to microbial growth. A water-resistant mattress can still allow microbes to enter the mattress. There is no way to scrub or sterilize the inside of a mattress, even with a “washable” design. Mattresses should be waterproof. The Naturepedic Ultra Breathable crib mattress IS waterproof, with a breathable pad on top. All of the Naturepedic mattress seem great- it’s actually pretty confusing which to pick. I’ve gone thru the guide but still unsure and indecisive. Which is your personal favorite one and why? Hi Lindsey, thanks for your comment. I don’t have a personal favorite, it depends on your needs. 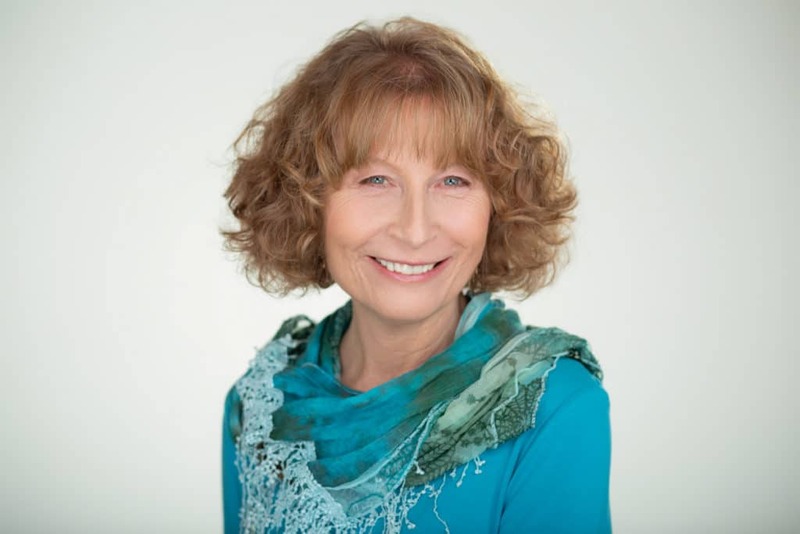 Feel free to give a call to our customer service at 800-402-8841 and Gaye will help you decide according to your needs. Gaye is happy to help. Or email at service@healthychild.com. We also have chat available. I have not checked into any of the materials they use in this mattress. However I have concerns about it. It’s not GOTS certified. What do they use to pass fire standards? What do they use to make it water repellent, antibacterial, antimicrobial (as they claim?) It’s not waterproof, and if air passes through the entire mattress, then so does baby’s wetness so that would not be hygienic. It’s very important for a crib mattress to be waterproof. Those are my initial thoughts.